Habitat: The plant can be found in Europe, USA, Asia Minor, India, Indonesia and Shri Lanka. It grows in shallow water in rich, moist soils. 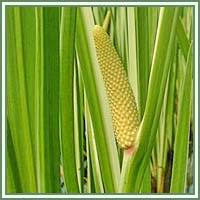 Description: Calamus is a perennial, aquatic plant. It has a cluster of basal leaves spreading directly from the rootstock. Leaves are sward-shaped, about 1 cm wide, with flat margins and parallel veins. Flowers are small, diamond-shaped, yellow and green in color. Flowering occurs from May to August. Medicinal use: Calamus has many traditional uses. Native Americans used the plant to soothe toothaches and headaches. Chinese medicine used the plant in treatment of deafness, epilepsy and vertigo. 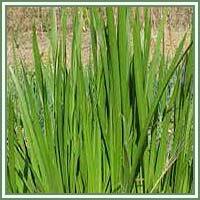 Ayurvedic medicine considers Calamus to be a rejuvenator of nervous system. The plant is mainly used in cases of digestive complaints. It eases digestion and enhances the production of stomach juices. Calamus extract is beneficial in cases of asthma, bronchitis, coughs, but also anorexia, intestinal colic, gastritic ulcers and gastritis.